Briehl, a Nord warrior, is an acolyte at the Temple of Mara in Riften, where he works under Dinya Balu and Maramal. Briehl never leaves the Temple of Mara and will wander around the chapel day and night, at random times eating, sleeping, conversing, or cooking. 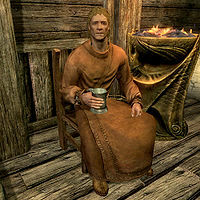 During the wedding ceremonies held at the Chapel, Briehl will sit silently in attendance while Maramal performs the ceremony. His only possessions are the clothes he is wearing, a set of monk robes and a pair of boots. You may question which of the Eight Divines he serves, to which he will answer, "This temple is dedicated to Mara, and the light of love she shines on us all. I'm only a humble acolyte, though. If you wish to avail yourself of Mara's blessing, you should speak with Dinya Balu or Maramal." If you are doing the quest The Book of Love for Dinya, he will add: "They should be back shortly. You're welcome to wait here if you like." This page was last modified on 13 August 2014, at 18:24.